Three teachers were recognized by the El Dorado Education Foundation (EDEF) for Teacher Excellence Awards as El Dorado Schools staff closed out the 2016-17 school year. 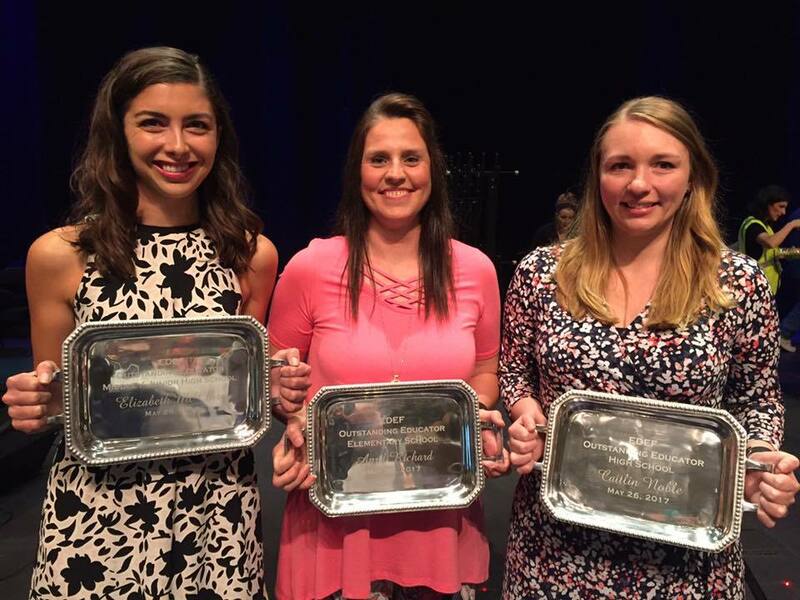 April Richard of Hugh Goodwin Elementary, Elizabeth McClure of Barton Junior High and Caitlyn Noble of El Dorado High School received the designations as Teachers of the Year for the respective grade levels. The EDEF Teacher Excellence Awards program was begun to recognize excellence in public school teaching at three levels – elementary, middle/junior high, and high school. It accepts nominees for outstanding teaching from parents, grandparents, guardians, students, former students, the public, and other teachers. This year, nearly 500 nominations were received. From nominations at each school, certified staff vote for 17 semifinalists. One semifinalist is chosen from each elementary school and Murmil Educational Center, three each are chosen from the middle school and junior high, and six semifinalists are selected from EHS (El Dorado High School). Semifinalists then proceed to the next stage – written application forms. Judges from the Education Department at SAU (Southern Arkansas University) in Magnolia critique these, further narrowing the field to nine finalists. These finalists are observed in class and interviewed by the SAU judging committee, to choose three winners – Outstanding Elementary, Outstanding Middle/Junior High School, and Outstanding High School Teacher. All semifinalists, finalists, and winners will receive recognition, plus monetary awards sponsored by the EDEF and Murphy USA. Elementary - Hugh Goodwin: April Richard, Northwest: Crystal Wells, Retta Brown: Lisa Hooks, and Yocum: Mindy Sivils. Middle/junior high – Washington: Kelly Reyes, Cathy Holmes, and Kari Carelock. Murmil Educational Center: Sheila Russell. Barton: Wendy Strickland, Helene Lambert, and Elizabeth McClure. High school level – EHS: Caitlin Noble, Sarah McKibben, Clair Antoon, Katherine Mobbs, Patrick Johnson, and Stephanie Fussell. Hugh Goodwin: Tina Anthony, Sally Bennett, Joan Cunningham, Lynn Dixon, Donna Fields, Brigette Haney, Angela Heid, Missy Inman, Joely Jackson, Stephanie Lowery, Lara Robbins, Kelsey Smith, Raven Swint, Amy Tucker, and Natalie Vaughn. Northwest: Nancy Bailey, Roddie Callaway, Bailey Camacho, Jordan Chandler, Christy Cranford, Kristen Davis, Amy Fulco, Amy Johnson, Ashley King, Jana Moree, Tobey Nunnally, Jennifer Reed, Linda Trostle, and Cindy Walton. Retta Brown: Brooke Bonsall, Veronica Curley, Sophia Goode, Latonya Green, Lisa Hooks, Varonica Kennedy, Felice Scott, James Scott, Stephanie Spain, and Tracy Sturgis. Yocum: Amy Beasley, Nancy Beene, Kristen Boothe, Kaitlyn Clark, Jennifer Duncan, Emily Gammon, Stacy Gulick, Chasity Hamilton, Johnna Harmon, Kim Ibert, Glenda Moore, Monica Nash, Casey Orr, Amy Rabinowitz, Tammy Waller, and Ja’mia White. Washington: Hannah Bowen, Ryan Bridges, Tyler Compton, Jesse Edge, Chris Ezell, Kristina Farmer, Deborah Guevara, Shane Hemme, Michael Herren, Leia Hickmott, Samantha Hurlburt, Catherine Kozubski, Amber Keefer, Henry Larson, Karla Long, Nicole McPhate, Alexander Michaels, Jennifer Michaels, Rachel Morr, Katy Murphy, Amber Nelson, Jennifer Odom, Tyler Phillips, Chris Rynders, Lesa Simpson, John Thompson, Christina Turner, Cecilia Williams, Tiffany Williams, and Hannah Young. Barton: Tyronza Bibby, Callie Caldwell, Adrianne Carey, Roy Clayton, Chae Coan, Alisa Davis, Amy Garner, Jarrod Hemund, Ali Hickman, Christina Hostetter, Sarah Huddleston, Sandra Jamerson, Heather Jennings, Jimmy Johnson, Adrian Knapper, Buffey Knight, Billy Major, Tammy McCloy, Kristie Mock, Scot Perry, Nancy Reynolds, Tonya Sims, Rachel Smith, Sarah Steele, Rebecca Streeter, and Kaci Travis. EHS: Pate Bauldree, Jill Boling, Chase Cantrell, Connor Cook, Shelley Forbess, Hinton Foster, Jessica Nash Freeman, Nicole Hellthaler, Kelsey Lea, Jamie Lowe, Joyce Martindale, Rebecca Mize, Shannon Neblett, Greg Oden, Ashlie Odom, Sheri Rankin, Destinee Rogers, Johnathan Sutherland, and Abbey Thomas.